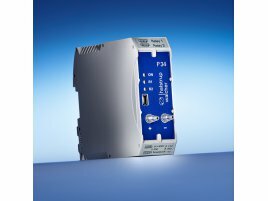 The P 34 differential pressure transmitter is designed for pressure monitoring applications in cleanrooms, laboratories, pharmaceutical plants and operating theatres as well as for special uses in machine and plant construction. As well as measuring the differential pressure, the instrument also records positive and negative overpressures as well as flow rates or volumetric flows. The measuring range is scalable in the range from 10 .. 100 %. Two optional contact points allow the user to connect visual or audible alarms that are triggered any time values rise above or fall below specified limits. The transmitter can be configured easily via an USB interface (optional) with software. A selectable time constant allows the transmitter to be adjusted perfectly to the pressure conditions and thus ensures a stable output signal. The P 34 can be mounted on top-hat rails.